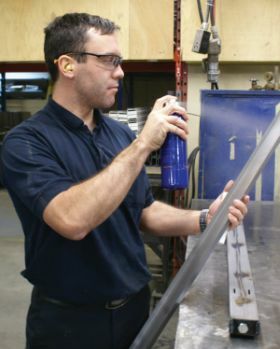 Walter Surface Technologies has announced the creation of AF-CLEAN, a new, environmentally-friendly surface cleaner and degreaser designed to replace toxic solvents in the preparation and cleaning of metallic surfaces prior to treatment. This newest innovation from the company's Bio-Circle Environmental Solutions division underscores Walter's commitment to "Making Green Work". AF-CLEAN is the latest solution that helps create a cleaner, healthier, and safer industrial work environment. An ideal alternative to acetone or toluene for surface preparation, AF-CLEAN cleans and prepares metallic surfaces prior to painting, priming, coating, gluing, corrosion protection, as well as cleaning moulds for plastic injection. Compared to traditional solvents, AF-CLEAN is non-flammable, VOC-reduced, biodegradable, and less volatile than toxic solvent compounds. "More and more industrial companies have insurers on their backs requesting premium increases due to the highly flammable and toxic nature of solvents used at their facilities. They are scrambling to find solutions. With AF-CLEAN, we have a winner ! ", says Timothy Houghton, President and COO of Walter Surface Technologies International. AF-CLEAN's environmental benefits bring economic benefits as well. Since acetone evaporates up to 90% of its volume before it actually cleans, workers will find they need less AF-CLEAN liquid to clean a surface -- it is 8 times more efficient than Acetone. AF-CLEAN's aluminum bottles can be filled and re-filled with Walter's Air Force automatic refilling station which is propelled by compressed air - unlike empty aerosol cans which must be disposed of carefully -- often at an additional cost. The liquid is available in a 10-litre (2.64 gal) bag-in-box and in a bulk 208-litre drum. AF-CLEAN and the Air Force refilling system significantly reduce costs for storage, handling, and disposal -- empirical tests have shown that a 10 L bag-in-box can replace as many as 36 aerosol cans! Want more information? Click below for video demonstration.